The following review also appears in the January, 2014, Bird Watcher's Digest. 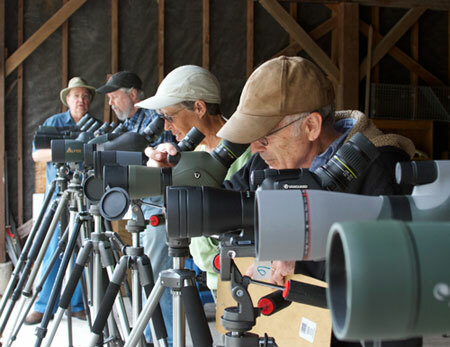 You start birding with a binocular, most likely 8 or 10 power. But soon you want to identify birds farther away. A good, full-sized spotting scope can extend your reach up to 60 or 75 power, but there’s a price. And it’s not just the money. It’s also the size and the weight of the rest of what you need. A spotting scope is useless without stable tripod legs to steady the image and a good fluid head to let you follow and find the bird. The whole outfit — scope, tripod, and head — can be an awkward and heavy burden to carry. And don’t forget you still need your binoculars and field guide along too. On the way out the door, you glance at the scope outfit and ask, “Do I really need to take you along?” And too many times, the scope loses the debate and stays home. And, too many times, that’s when you can’t quite see something you really want to see. A smaller, lighter scope doesn’t need as heavy a tripod or head, so the whole outfit can be much lighter and more compact. It can all fit into a carry-on bag. Diane named her first travel-scope outfit the “Guatemala Kit.” It weighed only 5 pounds and she happily took it up the side of a volcano while politely declining numerous offers from others to help carry it. 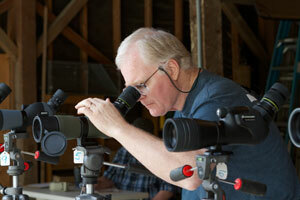 This review compares spotting scopes with objective lenses of 65mm or less. It aims to help you decide which small scope would work best for you. We spent several weeks testing and comparing 12 small scopes. 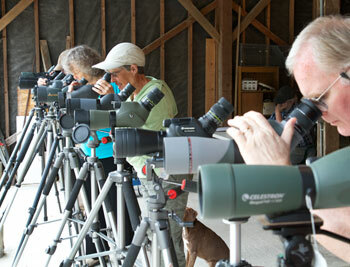 We also organized a test day so that local birders could try the scopes and give us their opinions. We tested each scope for resolution, to generate a number that reflects the relative overall quality of each optical system. 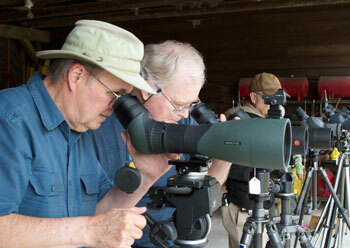 A scope's resolution score relates directly to how much detail you can see in a distant bird. We measured using a T-21-RP USAF 1951 resolution chart from Applied Image Inc. This chart is printed at such high resolution that you actually need a microscope to see its smallest elements. It’s comprised of progressively smaller groups of lines, with each group labeled by numbers that get larger as the groups of lines get smaller. These numbers are the scores in the scopes chart. 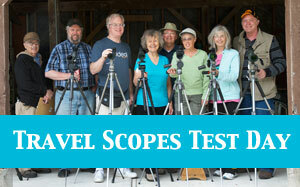 We tested each scope many times and averaged the scores when there was variation. 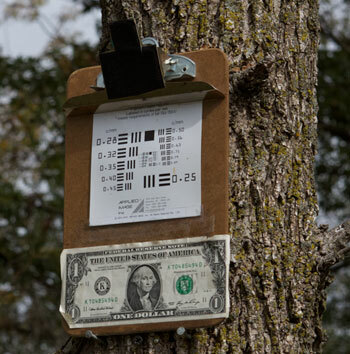 We posted the chart outdoors for the judges to study on the test day. For the resolution scores in the chart, we tested indoors using a 500-watt halogen work lamp so that the atmospheric conditions and lighting would remain constant. To minimize vibration, we mounted each scope on a sturdy carbon fiber tripod resting on a stone floor. The tester's eyes had normal 20/20 vision. 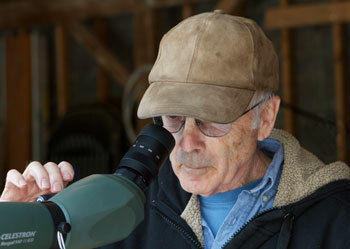 We kept a reference scope handy to check whether eye fatigue was becoming an issue. The reference scope was the Swarovski 95mm ATX, with a 30x to 70x zoom. Its scores are also included in the chart, so you can compare other scopes in the test to what a large, very high-end scope is capable of resolving. By comparing the resolution scores of the Swarovski 65 ATX and the Swarovski 95 ATX you can see a basic principle of telescopes. All other things being equal, bigger objective lenses deliver higher resolution. The modular eyepiece element, prisms, optical quality, glass, and anti-reflective coatings are the same in both these Swarovskis. The test scores clearly show the increased resolution produced by the larger objective lens. These tests were done with only one sample of each scope, and that sample could have been atypical. Small scopes have a slight advantage in resolution scores. Their small exit pupil makes them more immune from any astigmatism in the tester's eye and may allow them to deliver a sharper image. It's inherently unfair to compare a $175 scope to one costing over $3000. The reader should take price into consideration when evaluating scores. And scopes with lower scores in this chart may still be quite good optically. For perspective, we also included the data on the Swarovski 95mm reference scope that we used in our tests. 30x Column This shows what we could see at 30 power, which all the scopes in our test included in their zoom range. Max Mag Column This shows what we could see at the maximum magnification that the scope’s eyepiece allowed. Note that this is not a same-to-same power test. This is more a real-life, practical power test. A scope with a higher magnification has an advantage. This score shows how well, at maximum magnification, a particular scope will let you see a distant bird. Max Mag + 2x Column This is the same measurement as the Max Mag Column, above, but with a 2x magnifier behind the eyepiece. Again, this is not a same-to-same power test. This score shows what a person with better than normal 20/20 eyesight might see. It gives a little deeper look into a scope’s ability. Manufacturers' length specifications do not always include the eyepiece. We stood each scope on end and measured its length including the eyepiece. We weighed each scope, eyepiece attached, using an electronic postal scale. Manufacturers' close focus specifications may not all be done the same way. The results will depend on the close focusing ability of the person doing the test. We measured this distance ourselves, using the same person for all the scopes. Eye relief and field of view data are from the manufacturers' specifications. The scopes represented four focusing solutions. We found all the scopes’ focusing mechanisms to be responsive, smooth, and free from slack, so we did not score the focus solution in the chart but only indicated the focus type. Which is best is a personal preference. One A single focus knob, usually located on the top of the barrel in front of the eyepiece. The focus has to work fast enough to change range quickly and yet slow enough to allow fine focus adjustment. Two Two focus knobs. The front knob allows fine adjustments. The rear knob moves faster through the focus range. 2-Speed Zeiss has cleverly re-designed the focus mechanism so that one knob handles both slow and fast focus. For more detail, see the Zeiss review below. Barrel Instead of a small knob on top of the scope, a wide ring circles the barrel, like the focusing ring on telephoto camera lens. For more detail, see the Swarovski review below. Waterproofing is not in the chart because all the scopes in the test were waterproof. Space doesn't allow an individual review of every scope we tested, but here are some scopes that stood out. The 50mm Vortex Razor, the second smallest and lightest scope in our test, was introduced in 2013. It competes directly with the 50mm Nikon Fieldscope. The Vortex’s maximum field of view (191 foot at 1000 yards) beats the Nikon's. 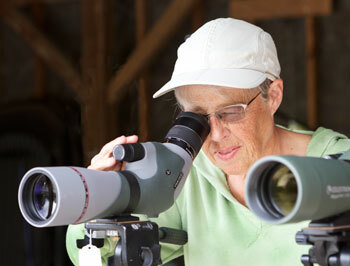 When you try to find a bird in a scope, the wider field of view at low power can save precious seconds. Furthermore, one of our judges noted that because it can zoom down to 11x, and is lightweight, you can hand hold it. You might get a quick look at a bird without setting up your tripod. Nice features include eye relief of 20mm, great for glasses wearers. We measured the close focus at 7.9 feet. The body is partially armored, at points of hand contact. Lens covers attach to the barrel by elastic rings, so they can stay attached to the scope while in use. It has a double focus knob. A slight flaw is the old-fashioned, roll-down rubber eyecup. And the tripod mount does not allow rotation of the scope to different angles. This little scope stood out as a favorite among our judges. Several wanted to take it home with them. We rate it the best scope in the small travel scope category because of its excellent optical quality, good zoom range, wide field of view, and long eye relief. It also has a very competitive price. The time-tested, popular Nikon is the smallest and lightest scope in our survey. At 30x, it tied with the small Vortex for best resolution, beating all the other scopes except the over-$2000 group. The 50mm Nikon has a single focus knob, focusing as close as 9.2 ft. The focus speed is well chosen for both fine and fast adjustments and turns with traditional Nikon precision and smoothness — not a trace of slack. Like the 50mm Vortex, but unlike all the other scopes in the survey, the Nikon has the old-fashioned roll-down rubber eyecup. Its 13mm of eye relief is less than ideal for glasses wearers. Other drawbacks include the lack of rubber armoring and, like the 50mm Vortex's, the Nikon tripod mount does not allow the scope to rotate. For years, the Nikon has enjoyed a top position in the high quality, 50mm travel scope niche. Now it faces a challenge from the somewhat less costly 50mm Vortex Razor HD. However, the Nikon has excellent optical quality, and if getting the absolutely smallest and lightest scope is your top priority, this is it! Here's a small travel scope that almost anyone can afford. At its maximum zoom of 45x, its resolution scores beat several larger, costlier scopes. It's remarkably light and compact, within one ounce and one inch of the 50mm Vortex. It's fully rubber armored and hand friendly. The single focus knob is smooth and slack free. However, its close focus of 25.3 feet was the longest in the test. And like the Nikon and the 50mm Vortex, it has no barrel rotation. Included with the scope is a tabletop tripod. We rate it a best buy. 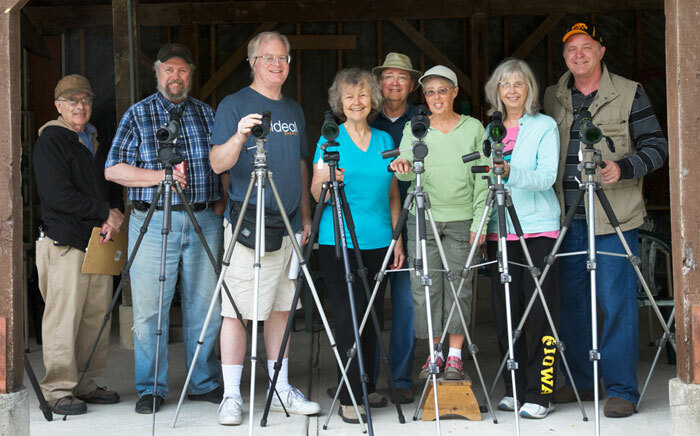 If you would like to add a small scope to your birding toolkit, but your budget is limited, here's the scope for you. 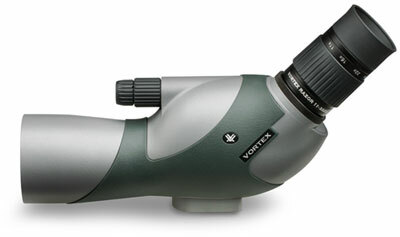 The 65mm Vortex Razor HD was clearly the best scope in our mid-sized and mid-priced category. It was also the most expensive, but it got the highest resolution scores in the group. 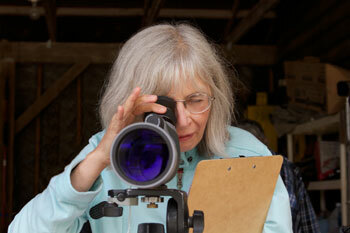 It had the best close focus distance in the group, 12.3 feet, and the widest field of view at lowest magnification. 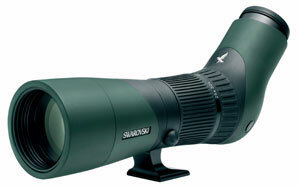 The scope is partially covered with rubberized armoring, giving it an attractive green-and-grey design. Our judges also praised the large, well-engineered, dual focus knobs. We found the 65mm Vortex's resolution approaches the quality of the three high-end scopes, and yet the scope costs much less. We rate it a high-resolution best buy and tops in the mid-sized group. One of the three least expensive scopes in our survey, the Opticron IS 60 stands out for its light weight (33.1 ounces) and good optical quality, as evidenced by its high resolution score in the Max Mag + 2x column. Some of our judges were happily surprised that such a small and inexpensive scope could be so good. For an entry-level scope or for the budget minded buyer, this is one to consider. Of the three high-end travel scopes, the Leica APO-Televid weighed the least. Its 19mm eye relief was excellent for glasses, and we noted that the eye relief did not seem to diminish as we moved through the zoom range. A twist-out eyecup has four positions for customizing the scope to suit your eyeglasses. The optical quality is superb, a beautiful wide view. Leica got the same resolution scores in the Max Mag + 2x column as the 56x Zeiss and the 60x Swarovski, showing its deep optical quality. 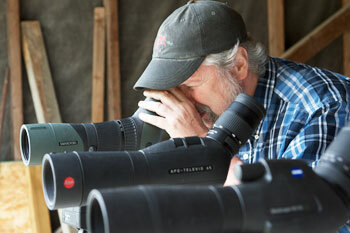 The lesser score in the Max Mag column is expected, as the Leica zooms only to 50x. The Leica has two focus knobs, partially recessed into the body of the scope. They are easy to find and turn, and their position offers good protection against snagging and damage. The scope is completely black rubber armored. Patches of leather-like textured armoring on the bottom and on the top near the focus knobs provide a design element and may make the scope easier to hold. Because it delivers super high resolution at a lower price, we rate it the best buy in high-end scopes. UPDATE: A Leica price increase in 2014 seems to have erased this particular advantage over the Zeiss. There is something unique about the Zeiss DiaScope. One single focus knob acts like a fast focus knob and a fine focus knob, putting an end to fumbling for which knob to turn. The first 270 degrees of rotation either way is precise and slow. After that, the knob shifts gears and starts moving the focus five times as fast. When you stop turning the knob, it automatically goes back to the precision mode. The solution works well but requires getting used to. If you share the scope with a friend, be sure to provide some hands-on instruction. Our judges noted that the Zeiss DiaScope's eye relief was good at both the minimum and the maximum magnification, but that it declined in the middle ranges. If you turn the zoom on the Zeiss while wearing eyeglasses, you can see the image circle shrink and then expand again as the eye relief changes. Resolution scores tied with the other high-end scopes. The DiaScope provides a bright, clean, sharp, lovely image, with more resolution than your eye can see. 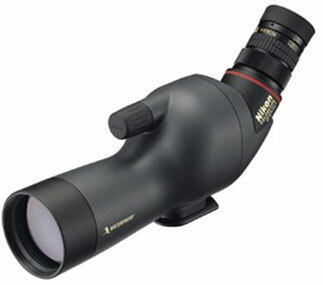 It has an extremely wide maximum field of view, 153 feet at 1000 yards when set at minimum magnification. Easy to locate a bird! With their new ATX model line, Swarovski has re-invented the spotting scope. It's now a modular system, much like an SLR camera. The scope is in two pieces, the objective module containing the front lens, and the ocular module containing the prisms and eyepiece. The same ocular module can take three sizes of objectives, 65mm, 85mm, or 95mm. You can invest in one ocular but have another objective to use for different situations. If you are digiscoping close to the car, use your 95mm. If you are traveling or walking far, put on your 65mm. The modules join together using a large bayonet mount located near the middle of the scope barrel. This way of joining is much stronger than the usual eyepiece mount. 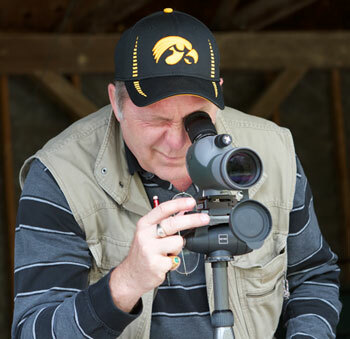 Instead of sticking out of the scope body, the eyepiece is integrated into the scope body. The whole system is protected and armored all the way from the front end to the eyecups. Eye relief is a generous 20mm, and the close focus, which we measured at 6.8 feet, was the best in the test. Both the focus and the zoom controls are located on the barrel, one immediately behind the other. You can switch between them instantly. They will work in cold weather with gloves or even mittens. The large diameter of the focus ring gives you great control over fine focusing. You can also move quickly from near to far by swiping along the top of the ring with the flat of your hand. It's an elegant bit of ergonomic design, a happy marriage of function and aesthetics. The ATX system seems designed from the get-go for digiscopers. The ocular module with its robust bayonet mount can securely support the weight of an adapter and camera. You'll enjoy stability, good alignment, and sharp pictures. Also, Swarovski has new digiscoping adapters to take advantage of the new design. It's a digiscoper's dream. Another detail. Most scopes have their magnification power scale printed on the eyepiece. It's often hard to read, and to confuse matters, there's often more than one scale. On the Swarovski ATX system, each objective module is able to have its own scale, with big, easy-to-see numbers. Small stuff like this helps make a great product. The 65mm Swarovski ties with the other high-end scopes for the highest resolution scores in the Max Mag + 2x column. However, because of its groundbreaking ergonomic design, the Swarovski wins, hands down, for best scope in the test. Of course, it's also the most expensive. But isn't that what money's for? All text and photos that include people are copyright 2013-2014 Birdwatching Dot Com.